Outlook CalDav Synchronizer synchronizes events and contacts between Outlook and EGroupware. Supported Outlook versions are 2019, 2016, 2013, 2010 and 2007. The Outlook CalDav Synchronizer is Free and Open-Source Software (FOSS). You can find and contribute to the source code on github. Having established the contact in December 2018, EGroupware GmbH started a cooperation with Alexander Nimmervoll from Generalize-IT Solutions OG at CalConnect. Soon there will be a purchase version of Outlook CalDAV Synchronizer, profesionally “supported” for EGroupware. Contrary to the freely available version, the purchase version ensures that EGrouware is tested regularly and reported errors are corrected. If you are interested, please contact us. The new EGroupware 19.1 will be released shortly. We’ll keep you informed here and in the EGroupware Newsletter. More information about EGroupware and open source topics can be found on facebook and twitter. in February the schedule was already quite full and right at the beginning of the year there were two exciting events. At the Univention Summit EGroupware was silver sponsor and at the CalConnect chief developer Ralf Becker and community manager Stefan Unverricht were able to make new contacts. In our February newsletter we would like to keep you informed about the latest developments at EGroupware. 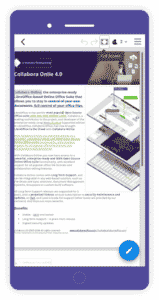 Collabora Online 4.0 was released on 14 February 2019. Further information can be found below in the newsletter. This release includes a new look, mobile improvements, improved interoperability, new dialogs and features, as well as a number of bug fixes and other improvements. Collabora Online 4.0 will soon be available in EGroupware Hosting and also for self-installations. 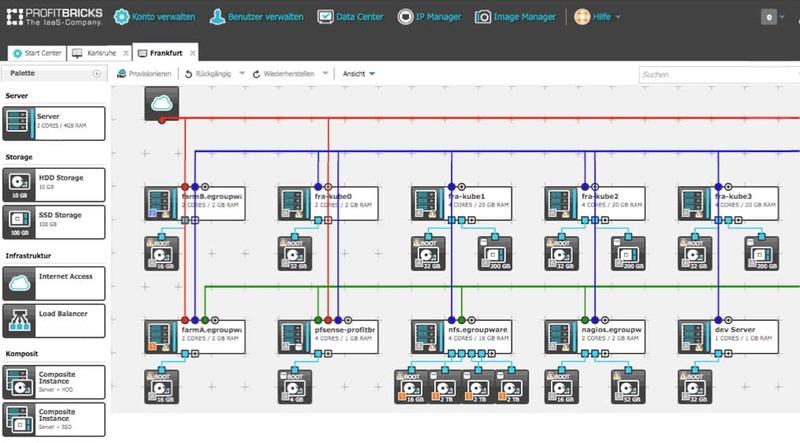 Having established contact in December 2018, EGroupware GmbH started cooperation with Alexander Nimmervoll of Generalize-IT Solutions OG at CalConnect. Soon there will be a purchase version of CalDAV Synchronizer for Outlook “supported” for EGroupware. With the CalDAV Synchronizer you can synchronize address book and calendar data between EGroupware and common Outlook versions. Contrary to the freely available version, the purchase version ensures that EGrouware is tested regularly and that reported errors are corrected. If you are interested, please contact us directly. More detailed information will soon be available on our website. Optimization for GDPR Address book policies and admin history support the implementation of the basic data protection regulation. Communicate via Rocket.Chat: Integration of Rocket.Chat including screen transmission and video chat. Rocket.Chat is an open source team chat platform that allows you to communicate securely and easily in real time with other people within ECroupware. Rocket.chat is the leading open source alternative to proprietary chat tools like Slack, Microsoft Team, Hipchat or Stride and extremely user-friendly. Improved user interface: Modern theme with colored icons and increased use of avatars (users can assign a photo or graphic to their profile). Optimized collaboration with Collabora Online, e.g. new option to send a sharing link to externals for editing documents. 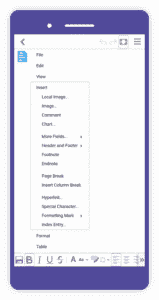 This link opens directly in Collabora Online. It is also now possible to insert images directly from the EGroupware file manager. Improvement of various EGroupware functionalities, for example the possibility to edit comments in the ticket system afterwards, color design in the ticket system according to subject area, category or version. The toolbars have been updated with a lighter color scheme and the colored Colibre icon theme (thanks to Andreas Kainz), which significantly improves the look of 4.0. The colored icons fit very well to the new EGroupware theme, which will be available with EGroupware 19.1 as “Modern Theme”. You can also use EGroupware 19.1 to share documents (sharing link), send them directly via e-mail or insert images from the EGroupware file manager. The new version ist now available in the EGroupware Hosting. Retina / HiDPI Display Enhancement: Use the browser’s native higher DPI to render with the actual resolution of the display and get crisp pixel rendering, for example at 200% zoom. Enhance multi-touch behaviors such as zooming and panning to take advantage of the full functionality of desktop dialogs larger than a mobile screen. data security is becoming more and more important to most of the companies – especially to those who handle sensitive customer data. Starting with EGroupware Version 17.1, that will soon be published, we’ll offer encryption with S/MIME as an alternative to PGP. On Tuesday, 12th of September 2017 we offer a free webinar about the encryption with S/MIME. The webinar will start at 16.00 pm (CEST), please log in to our webinar room in time. – How do I create my own key? – How to save the public keys of my contacts? – How to sign or encrypt e-mails? – I want to take part in the testing phase – how can I test the S/MIME encryption with EGroupware? If you’re interested in the encryption with S/MIME and like to take part in our testing phase, please contact us: info (at) egroupware.org. We’d be happy to provide an EGroupware testing instance to you! At the EGroupware user convention in Mainz, one of our workshop topics was “Encryption: PGP vs. S/MIME”. In case you’re interested in different encryption methods, you can access the >> presentation slides here. We invite you to join the EGroupware User Convention on 23rd and 24th of June in Mainz, Germany. Visit our workshops, learn more about EGroupware and get in contact with other users. We’re looking forward to talk to you about the new cloud hosting operational concept of the EGroupware GmbH. Find out more about the upcoming development of the groupware, our “Roadmap 2017” and take the opportunity to talk to our developers and consultants in person. Is there anything concerning the software, that’s particularly interesting for you? Would you like to talk about your special scope of application, perhaps in one of the workshops? No matter if Community Version, EPL or Cloud: Our ambition is to intensify the information exchange with EGroupware users. We’re looking forward to your topic suggestions! EGroupware: Updates to the current Version – what to consider? EGroupware: CE or EPL – Differences and Advantages? Please send us your feedback to the possible topics and add your own suggestions. We’re exited about your ideas! You’ll soon receive a detailed programme with the option to register. Quite a bit has happened during the last weeks. As already announced, the whole hosting cloud infrastructure moved to the German data centre provider Profitbricks. The move is successfully completed, all instances are now running in the new data center in Frankfurt/Main, Germany. After an extensive research and talks to different providers, we decided to work with Profitbricks as an experienced, German cloud computing supplier. We’re happy to present you the new operational concept for more reliability today. Data storage takes place in Frankfurt in two independent storages in different fire compartments on several hard drives. Servers are virtualised and will be automatically started on new hardware in case of a hardware failure. Servers can be equipped with more ressources anytime during operation (e.g. storage, CPUs). The EGroupware hosting farm runs under the open-source system “Kubernetes”. It manages the orchestration of the containers. The hosting farm itself communicates with a “Galera” database cluster and the “NFS” server for files. Daily database backups and snapshots of the files are automatically created and saved for at least 30 days. This means, if you accidentially delete files, they can be restored. The standards of Profitbricks and EGroupware guarantee an extended stability and failure safety for all EGroupware hosting customers. To offer even more failure safety, EGroupware now additionally runs in a second Profitbricks data centre in Karlsruhe, Germany. All EGroupware data is consistently replicated (files every 15 minutes) and stored in this second data centre. In case of a service failure in Frankfurt, hosting customers can hence access their latest data in Karlsruhe. In this case, we’ll automatically activate a reading access to your data. Should there be a longer service failure, we now also have the option to enable the backup hosting farm as a primary platform. Even in case of a longer regional interruption, we can therefore react quickly and make all your data available. To test your EGroupware data, stored in the backup farm, you can access it with this URL anytime: „instance name – top-level domain.egroupware.cc“. For example for our support centre instead of “my.egroupware.org”: „my-org.egroupware.cc“ or “mycompany-net.egroupware.cc” for all “.net” domains. In case of a service failure, the switch from the primary hosting farm to the backup hosting farm takes place automatically. The scheduled move of the EGroupware mail farm to the data centre of Profitbricks will take place by the end of June. We’ll also establish a replication of all mail data in both data centres. Therefore we’ll also achieve an improvement of spam filtering and virus protection. Customers of the EGroupware mail hosting will be informed about this process in a separate e-mail. We would like to take this opportunity to thank you for the trust you have placed in us. Thank you for the valuable cooperation. Our team will be on vacation from December 22nd, 2016 until January 2nd, 2017. Should necessity require it, you can still reach one of our team members during this time. Starting with Tuesday, 3rd of January we’ll be back in the office. EGroupware hosting receives A+ rating from SSL LABS! EGroupware hosting again receives A+ rating concerning security from SSL LABS! SSL LABS is testing the ssl setup of domains and gives a top rating to EGroupware.